Well a few threads came together this week. It’s always the way when you are trying to keep daily transport going and fix up other bikes. First up is the Atlas. We managed five days commuting but on the Thursday it looked like a VFR day was upon us as the sprag started to slip once again. Fortunately however it managed to start on Friday so we did the complete week. Investigation showed no damage to any part of the sprag so I reassembled using the Australian springs. These springs are shorter but they hold the rollers firmly. I am hoping that they will prove more able. The sprag issue is starting to become a real mental issue for me. I hate bikes that have a fundamental flaw in their design and I think for the Atlas the sprag is a fundamental flaw – maybe however thinking about it the sprag is okay is the starting which is at fault – a fault that found its way onto the Zane derivatives. Most Atlas owners moan about poor starting and of course the more it won’t start the more you pressure the sprag…I had a good spark from the HT leads so I looked at the plug caps and these seem to wobble a bit but my local shop didn’t have replacements. I checked out their resistance to see if the plugs were breaking down and I’m assured readings of 5.16 and 5.6 are within tolerances. I’m thinking that the real issue here is the carb’ and so next step will be a set of new jets and float along with a thorough clean. I had another task with the Atlas this weekend which was to check out a shortened shock for a friend. The Hagon shock was modified to lower the ride height but when fitted didn’t return properly. Hagon admitted there was stiction so having sorted this I agreed to check it before sending it off to Germany. Hagon have sorted the problem and I must say the result does lower the bike significantly – a good solution for a lot of the owners I know who are short, even at 5,10 I struggle to clamber aboard! 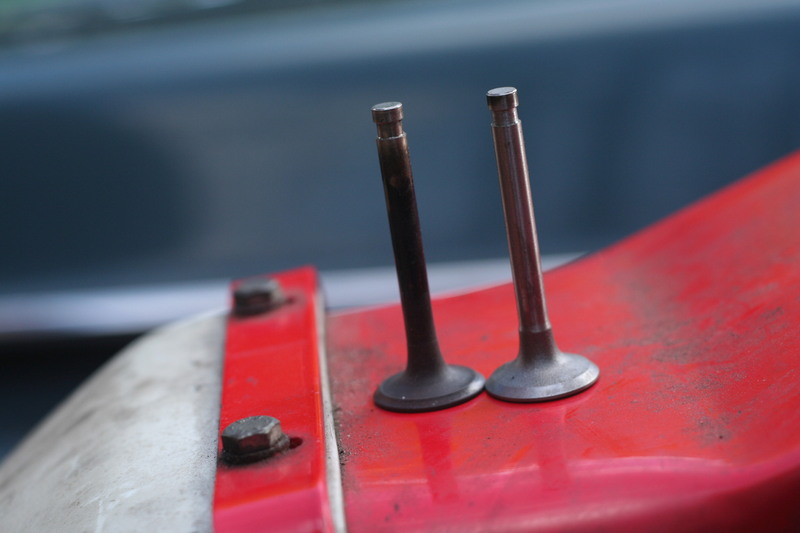 Aside from the ongoing Atlas saga progress was made on the 100 with the delivery of fresh valves! Dropped off the old ones on Sunday and there were a new set on Friday. The valves have been turned out of something ‘close’ but they look fine and mean I now have the potential to get the 100 going again. The VFR needs its annual roadworthiness test and has a border line rear tyre so perhaps a couple of days to shoot this tyre and buy some breathing space might be a good thing. A ‘lost’ weekend. Visited friends so didn’t have much time. 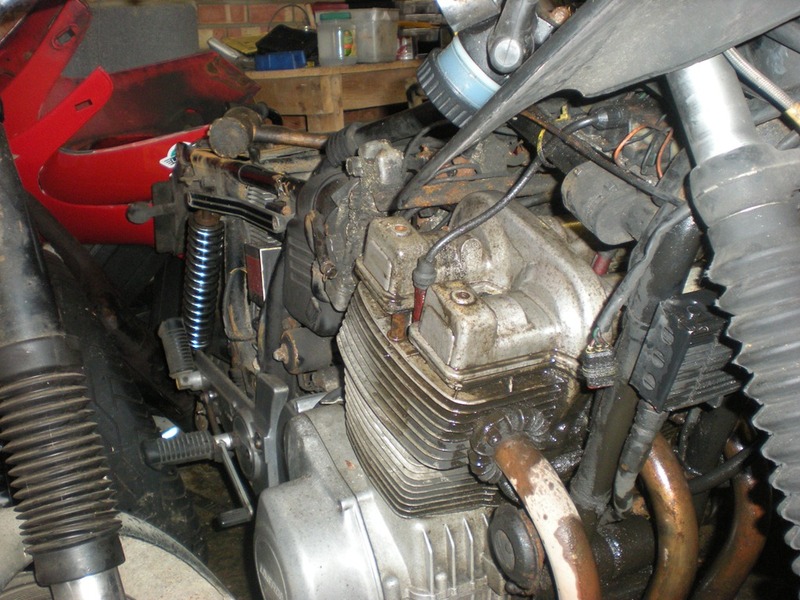 Did manage to take the fork tops off however and pour out the old oil – well at least what was still in there! I didn’t measure it but I’d guess at less than a 100 ml came out (should have 300 ml). When I was riding the RGS regularly I’d used ATF instead of pukka fork oil – jeez the smell of this old ATF certainly lingered! I had a look at the forks and the inners and couldn’t see anything wrong. The fork seals are fine, infact they were dry and didn’t need replacing – those fork gaiters off an Enfield India get the thumbs up! I’d expected the fork springs to have ruptured the pre-load spacer as had happened once before and made the forks sag. Nothing this time round so I’m hoping once I put the fresh, genuine SAE 10 weight fork oil in everything will be okay. 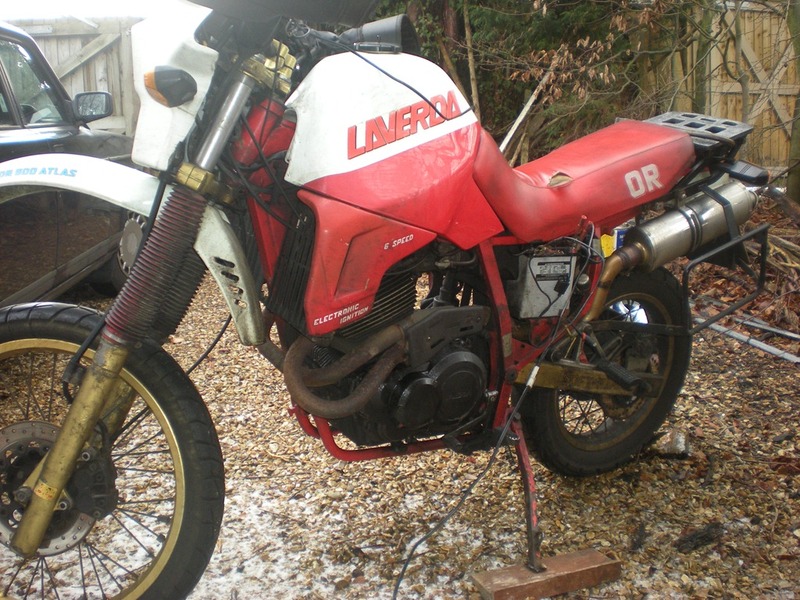 My trip down to the New Forest to see friends wasn’t a complete wipe out in terms of working on the Laverdas. I’d picked up a tip when buying some Morris’s 20/50 from a local garage that a firm down in Fordingbridge might be able to knock up some replacement valves for the 100. A quick call confirmed this so the family trip took a minor detour. Reckon it could be around £40 per valve but given how difficult it is to find these valves that sounds like good value. No VFR days this week – the Atlas sprag held up, helped I suspect by the milder weather and the fact I only went out three times. The Atlas still isn’t starting that well however and I have had to crank the engine quite a bit to get it to fire up. 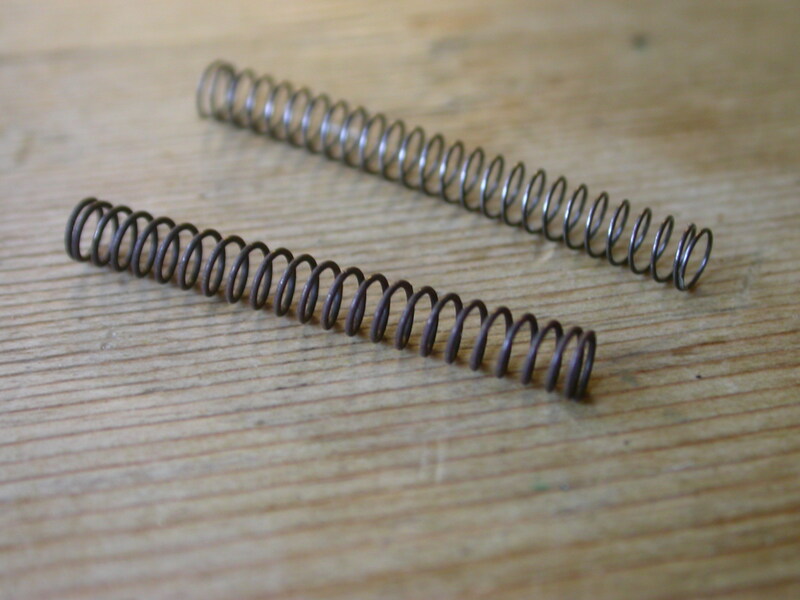 I have thought got the Australian sprag springs. 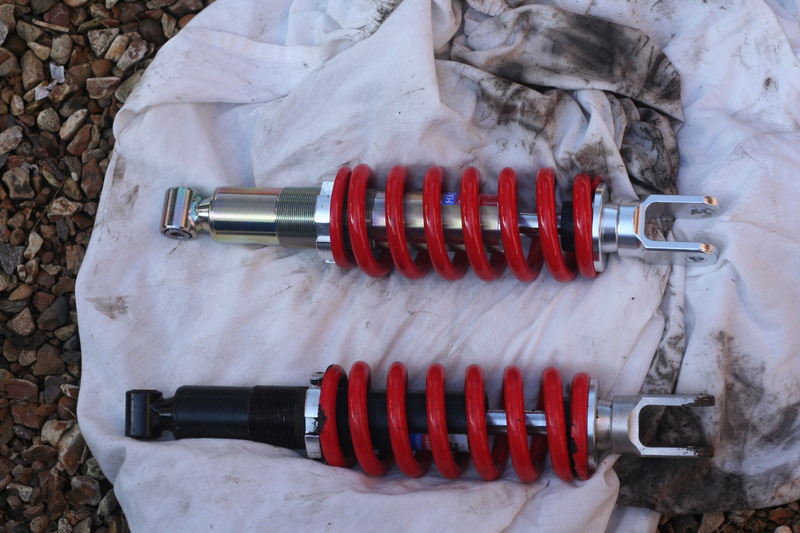 These look a lot tougher than the standard springs – although also a bit shorter. In a way I wouldn’t mind if the sprag gave up again so I had an excuse to see how these antipodean beauties go! Another VFR day on Thursday as the Atlas broke its sprag clutch after just three days! I didn’t think more pictures of broken springs would be that interesting. The weather in the UK has been pretty cold this week (minus 5) and I think this may have pushed the sprag too far. When I drained the oil (it needed changing) it was pretty thick so despite putting the battery on the ‘optimate’ each night the cold probably did the sprag. One of the upsides however was that it was my first call of the year into Richard Slater who was his normal jolly self. We got to talking about unexpected sightings when I told him that James White-Cooper had spotted me on the Atlas in the London rush hour. Richard told a tale of how he was walking down the road with Piero Laverda back in ‘78 following a bike show (either Earl’s Court or Olympia he couldn’t remember) when out of the traffic emerged a brand new green Mirage. Piero joked to Richard that it was a set up. Got me thinking that Richard must be loaded to the gunnels with these kind of stories and someone ought to get them written down! The other thing that Richard told me was that the Laverda 500’s were also pretty shabby starters. If you think about it this trait extends through the Atlas and onto the Zane bikes, so they never got it right hey? The other positive to come out of the latest sprag issue was Dave Roberts from Australia offered to send me higher spec springs that his club has had made up. At $1.10 Aus a piece they work out slightly cheaper than the UK version. I’ve ordered 4 sets (24) so I have some spares on the shelf. This week saw the first ‘VFR day’ of the year when the Atlas failed Friday morning. Despite the temperature of minus 5 degrees the cause turned out to be the normal Laverda issue of an incompetent owner…I’d reflected during the week on the sprag clutch repair and wondered if I had put in standard 10mm rollers or 10.3mm rollers – if I’d put in the latter then I ought to have used the original worn starter gear. Of course I’d matched the 10.3mm rollers with a new correct size starter gear and the two don’t go together…5 broken springs and 5 ‘mashed’ plungers meant there wasn’t enough puff in the starter mechanism to turn the engine sufficiently for it to start. I think it was Wednesday when as I pulled away there was an odd noise in the engine, which of course I ignored! 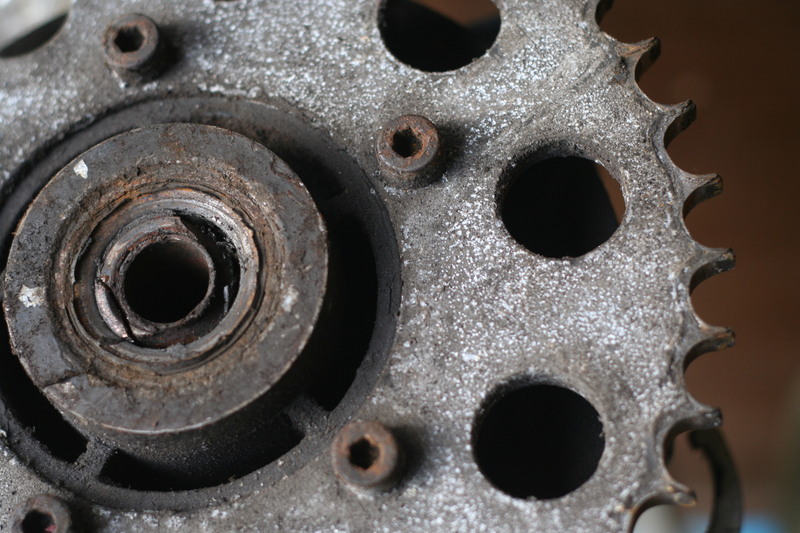 My most recent exploration of the Leo Zimmerman sprag clutch revealed a few more of its secrets. It is damned robust! Broken plungers made no impact on the casing, this is one tough piece of kit. I also found that there are threaded plugs behind the springs which are easily removed with an allen key and when this is done and the sheet metal ‘guard’ removed (this is held by screws whereas on the original it is ‘tack welded’ in place so not easy to dismantle and reassemble) cleaning and ensuring everything is working becomes a doddle. 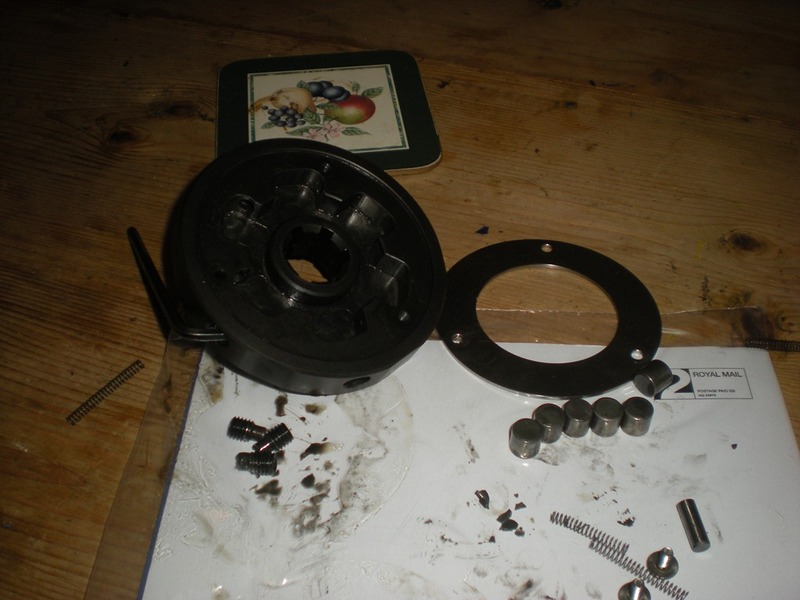 I did as it turned out have enough spare plungers and springs to get the sprag up and running. I had thought I might need a few springs so in anticipation bought 6 ball point pens for £2.94 so I could borrow the springs. I had to look through a number of options before deciding the Bic Crystal Click offered a spring closest to the Laverda part! I’m determined that as well as keeping the Atlas going I have to also do something each week to move the RGS back towards roadworthiness. It becomes hard when you have to attend to the daily hack as well breaking new ground but then that is the lot of needing a bike everyday. I decided to carry on with the forks and also starting to clean off some of the road grime. I got the fork caps off quite easily and initial inspection seemed to suggest no problems. I had expected the fork spacers to have split over the fork springs leading to the sag I’d experienced but everything seemed to check out. The most noticeable thing was the smell of old oil as I opened up the forks! Anyway not finding any obvious issues I pressed on and dropped the forks out of their yokes for full dismantling next week. There is lots of grime over the bike and I began going through it with paraffin and a toothbrush just to get some of the oil and road salt off. 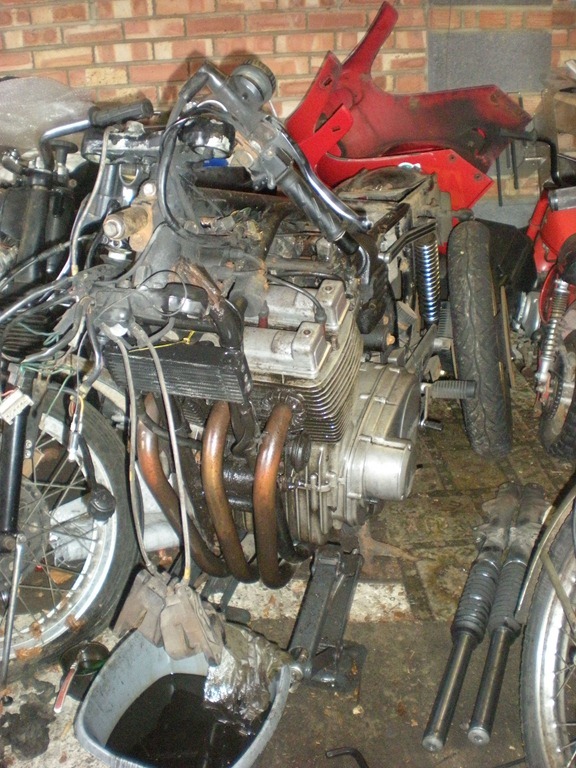 This superficial clean up will have to extend to something more substantial – certainly the carbs’ are going to have to come off and I think I’ll also have a look at the valve clearances. The wiring also looks a mess. The thing is though to keep a focus on the aim with the RGS which is not to make it immaculate but to get it back on the road to act as backup. Finally the Atlas ended the day by firing up once the battery had been charged…let’s hope tomorrow is not a VFR day (especially as the Atlas has the muffs and heated jacket circuit).